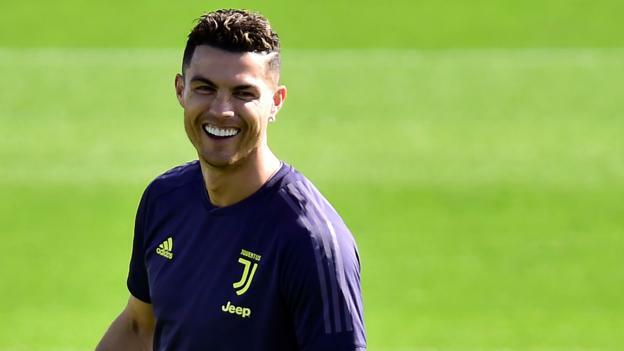 “Unstoppable” Cristiano Ronaldo will return to the Juventus team to face Ajax in the Champions League quarter-final second leg on Tuesday. The Portuguese scored in the 1-1 draw at the Johan Cruyff Arena last week, but was one of several players rested for Saturday’s 2-1 defeat at SPAL. “Cristiano has extraordinary quality,” said boss Massimiliano Allegri. Ajax’s biggest worry is about midfielder Frenkie de Jong, who hurt his hamstring in Saturday’s 6-2 win over Excelsior. Coach Erik ten Hag said they were confident he would be able to play. “Frenkie himself will have to decide if he is ready, and eventually I decide if he will play,” said Ten Hag. Ten Hag said he was is optimistic his side can cause another upset, having beaten Real Madrid, European champions for the past three years, 4-1 at the Bernabeu in the last round. “I’m confident because of the way we are playing and training. We are stronger and we are showing it game by game,” he said. “Juventus are the favourites, especially after the Amsterdam result. Allegri has called on the Italian giants – who are one point away from winning an eighth consecutive Serie A title – to repeat their own heroics of the previous round against Atletico Madrid. Ronaldo, the tournament’s all-time top scorer, scored a hat-trick as they overturned a 2-0 first-leg deficit. “It’s a one-off game and we need to play with the same attitude as we did against Atletico,” said the Italian. Juventus are unbeaten in their past 10 meetings with Ajax, the joint longest run for one side against another in European matches (also Bayern Munich v Benfica). After a run of seven defeats in eight games away against Italian opposition (D1), Ajax are unbeaten in their past four (W2 D2). Juventus are looking to reach the Champions League semi-finals for the third time in the past five seasons, also making the last four in 2014-15 and 2016-17. The reverse match was only the third time Juventus have drawn the first leg of a Champions League knockout match away from home – they progressed against Rosenborg in the 1996-97 quarter-final, and were eliminated by Manchester United in the 1998-99 semi-final. Ajax have been eliminated on two of the three previous occasions they have drawn the first leg of a Champions League knockout tie at home, most recently in the 2005-06 last 16 against Inter Milan. Juventus have lost two of their past five Champions League home games (W3), as many as they had in their previous 45 (W28 D15). Ajax have won their past two Champions League away games, last winning more consecutively in the competition between November 1995 and March 1997 (seven). Juventus forward Cristiano Ronaldo has scored in his past five Champions League games against Ajax, netting eight goals in total. The Portuguese has also scored 51% of his total goals in the competition in the knockout stages (64/125). Dusan Tadic has been directly involved in 53% of Ajax’s 17 Champions League goals this season (six goals, three assists). The last player to score more than the Serb for Ajax in a Champions League campaign was Jari Litmanen in 1995-96 (nine).